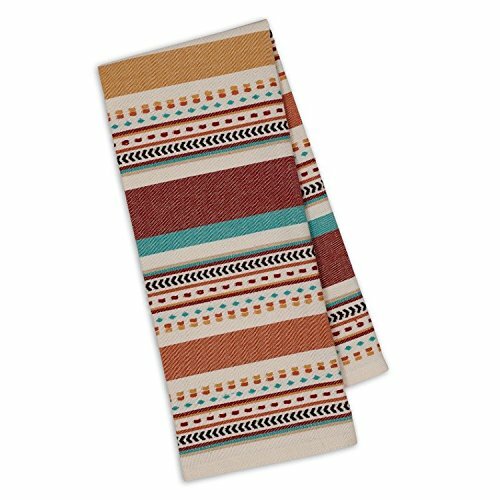 Bring a rustic, desert, Native American feel to your home with the, set of 2, Santa Fe Dobby Stripe dishtowels from Design Imports Southwest Table Linens Collection. The dishtowels have decorative stripes of gold, red, turquoise and orange, measure 18″ x 28″ and are made of 100% cotton. The dishtowels make a lovely hostess, housewarming or holiday gift or perfect for everyday use. Add style and functionality to your kitchen. Perfect for tackling all of your drying and cleaning needs in and around your home. For best results, machine wash cold separately in the gentle cycle. Tumble dry low and low iron. Wash separately before use. PERFECT FOR: Tackling all of your drying and cleaning needs in and around your home. The dishtowels make a lovely hostess, housewarming or holiday gift or perfect for everyday use. CARE: Machine wash cold separately in the gentle cycle. Tumble dry low and low iron. Wash separately before use. Beautiful quality I gave these to my mother in law for Christmas and she loves them so much!